Egypt's Constitution Party: New hope for liberals? 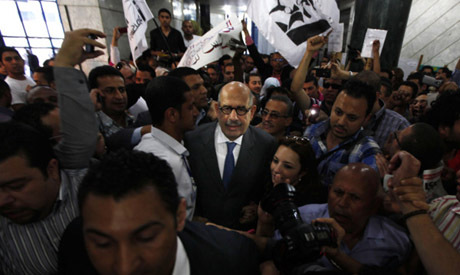 The Constitution Party, founded by reform campaigner Mohamed ElBaradei, received formal legal sanction as a political party late Sunday, following a decision by the High Court's Political Parties Affairs Committee. "The Constitution Party is a party of human values, social justice, and of knowledge and reason," ElBaradei said via Twitter following the decision. Starting Monday, the party will be allowed to participate in political activities. The Constitution Party officially submitted their party registration papers to the Political Parties Affairs Committee at the High Court on 29 August. Prominent members of the party were present at the High Court on 29 August, including Emad Abou Ghazi, former minister of culture, Gameela Ismael, former member of the Ghad Party, George Ishaq, activist and founder of the pro-change Kefaya movement, and Shady Ghazali Harb and Nasser Abdel Hameed, members of the Revolution Youth Alliance. The Constitution Party was launched by liberal activists in April 2012 and aims to unite Egyptian regardless of their "religion, colour or ideology." Well done, stated. Every good wish.